Today I went to the Jardin des Plantes and read Felix Holt – not all of it of course. It was so nice that I took a picnic back there in the evening and continued to read. The garden houses the Muséum d’histoire naturelle de Grenoble, some lovely lawns to sit on, beautiful flower beds and a play area for children. 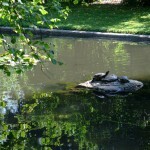 There were even some turtles sunning themselves on a rock. 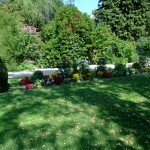 This entry was posted Thursday, July 15th, 2010 at 9:14 pm	and is filed under Gardens, Things to do, Travelling. You can leave a response, or trackback from your own site.